Crew Drop one to Dodger Blue ~ The Bucky Channel - The World of Sports from Wisconsin's Perspective. 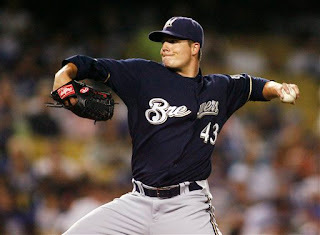 The Brewers dropped another tough game last night against Chad Billingsley and the LA Dodgers, 3-5. Parra started out relatively well but struggled through the 4th and 5th innings. He ended with 5 and 2/3 innings pitched while giving up 4 runs and striking out 6 in the loss. Even though Kapler has played well, I think it is safe to say the Brewers miss Braun's presence in the line up. The Crew have now dropped 2 straight. Really though, winning just one in this series would be satisfiable considering we have our 3, 4, 5 starters playing a hot team on the road and on the west coast, which has been a house of horrors for the Crew over the years. By the way, its pretty safe to say Mike Cameron is on fire right now. In the month of August he has hit 5 HR, 1 3B, scored 12 runs, has an average of .304, and OBP of .418 and a ridiculous OPS of 1.136. I'll be honest about last nights game which started at 9:40 pm central time. I didn't catch a whole lot of it. Unlike Winks, I'm a certified Olympics fiend. I'm talking day, night, live, taped, online, any format really. I even keep it on while I sleep in case I wake up so I can catch whats going on. I really get in to the whole country pride thing. In years past, America has kind of shied away from that, but this year I have seen more of it and it's kind of refreshing. Maybe it's because we have a country that rivals us closely in China during these games. Say what you want about the Olympics, but it really is the epitome of sport, the best at what they do vying for not only themselves but for their country. Either way last night I was watching more 10K walk race and heptathlon than my beloved Crew and America's past time. The one thing about last nights game that did bug me was Corey Hart's 0-4 performance and especially his 0-2 with RISP. Hopefully Braun is back in the line up Sunday as he is expected to be out again tonight. Catch the Crew tonight, unless you are watching the Olympics which is completely acceptable. Game time is at 9:10 pm on FSN Wisconsin, Dave Bush v. Derek Lowe. TBC's Player of the Game: Gotta give it to Gabe Kapler. 2-4 with a first inning HR too bad it wasn't enough.